What's that smell? Oh, it's bacon cooking! Everyone knows that smell. Well, it seems that even vegetarians know that smell and it can be tempting to them. Very tempting. NPR published an article on Friday about vegetarians and bacon, and it's a great read about the psychological effects the smell of bacon has on people. 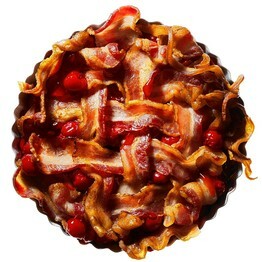 "It seems that bacon has a way of awakening carnivorous desires within even some of the preachiest of vegetarians. And we set out to find out why." It seems the "why" lies in the evolution of primal man to find high fat/calories especially desirable. The smell of bacon cooking conveys its fatty goodness in a way that our bodies have a primal identification with. 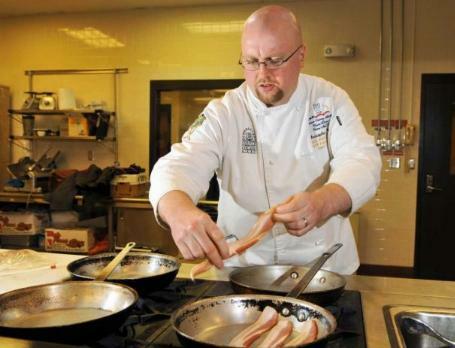 Johan Lundstrom, the scientist from Monell Chemical Senses Center quoted in the article, also believes that the association of memory/emotion with smell plays a big part in bacon's attractiveness. If you had a good childhood with family breakfasts featuring bacon, you'll relive those memories when smell bacon cooking. I can totally see how bacon would tempt even the hardest of vegetarians back to the meaty dark side. If this wasn't true, why would they have to make fake bacon? No, it's just a joke gift box from Archie McPhee. If only. Okay baconistas, let's talk fashion. The photo of the bra made out of uncooked bacon wanders around the internet, and people have see Gaga's meat dress, but wearing real meat is kind of gross. I mean, it'll leave slimy trails of fat all over you and stain anything you sit on. Makes a great statement, but just not practical. 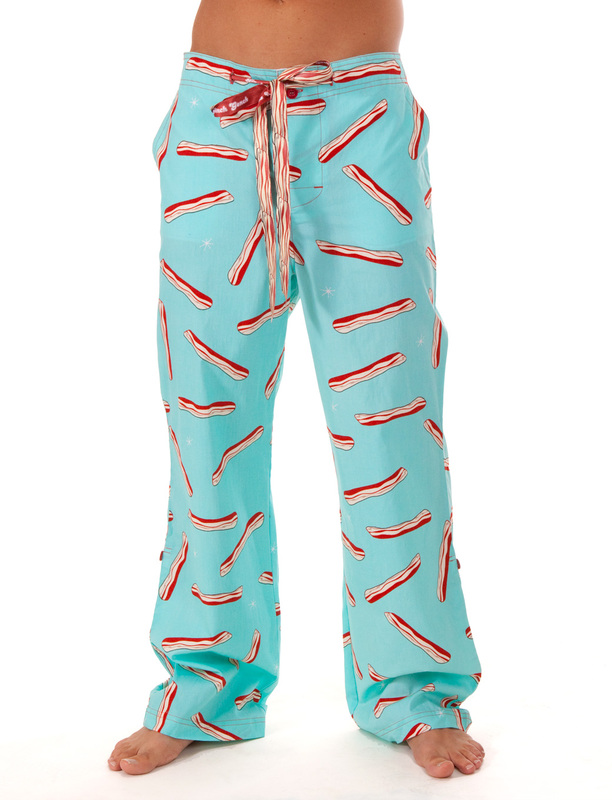 So what can the bacon lover wear to show off their love for meat candy? 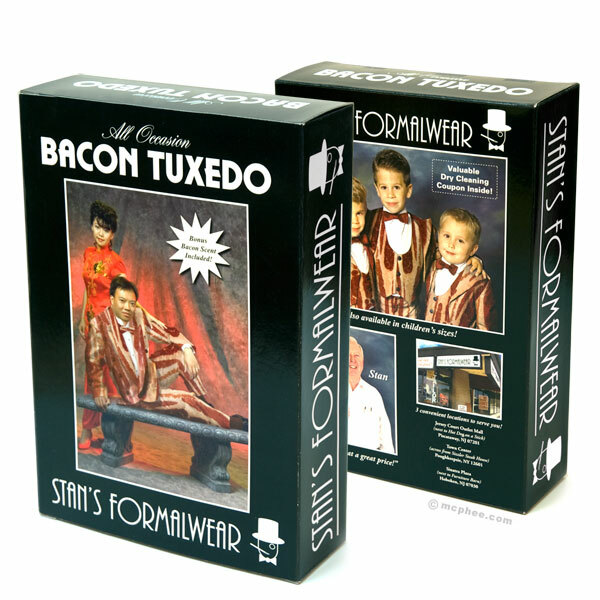 Well, I've collected a bunch of nifty bacon fashions here for you to select from. You can choose one piece to accent your wardrobe or go hog wild and build a head-to-toe bacon outfit! 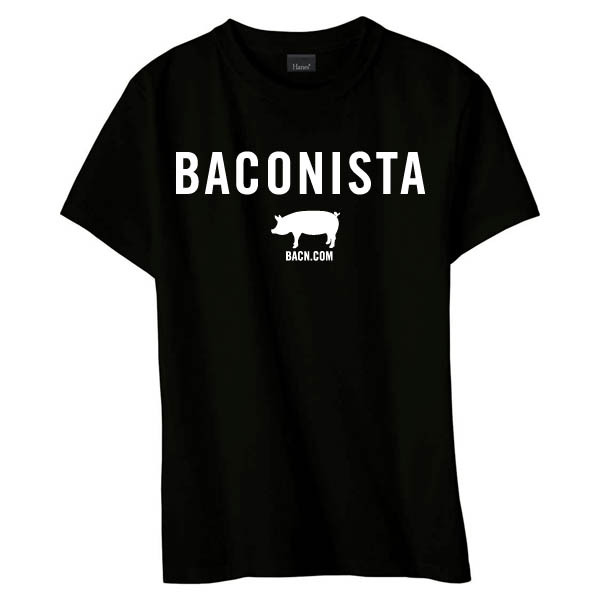 Let's start with what should be a staple in any bacon lover's wardrobe - the Baconista t-shirt from Bacon Freak! I love this shirt. It comes in black, blue and pink in both a men's t-shirt and a women's t-shirt for $15.95 and $17, respectively. The design is simple, yet really really cool and leaves no doubt as to how you feel about bacon. Bacon Freak has a LOT of t-shirts, by the way. And hoodies. And tank tops. And aprons. 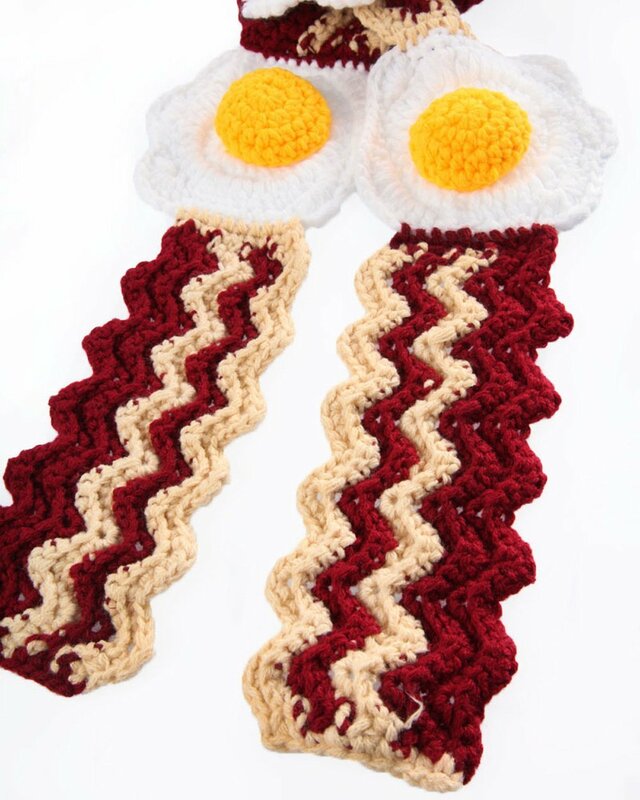 They're definitely worth taking a look at if you want to show your love for bacon with a clothing choice. 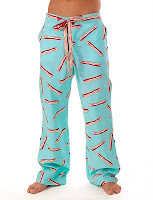 Moving on down, we find some awesome men's bacon print pajama pants and the women's version as well from Ginch Gonch. These are really cool! They're also on sale right now for $19.50 for men's and $18 for women's (regular price is over $30, so you might want to grab some now). Personally, I wish they came in more colors - I would totally rock a black pair - but the light blue/turquoise is still a good choice for showing off the bacon print. 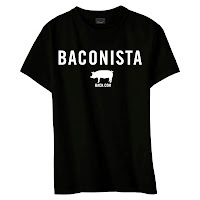 Of course, if you want to be a REAL baconista and not some poser who is only half-bacony, you NEED to be completely bacon-upped. The way you do this is with bacon underwear! If you like the bacon pajama pants, you'll love the bacon boxers! 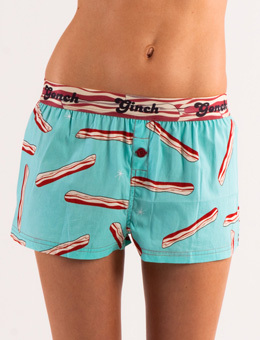 Ginch Gonch offers both men's boxers and women's boxers in this print, also on sale for $13 and $11.50, respectively. 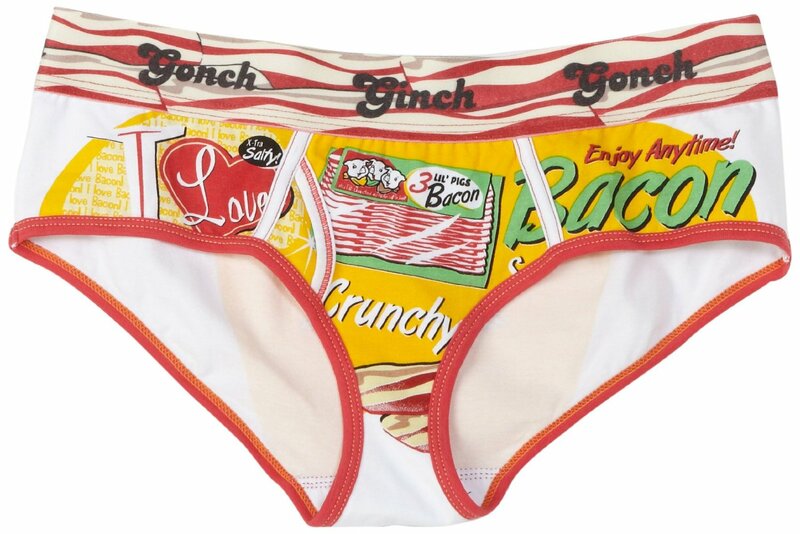 These briefs are also from Ginch Gonch. 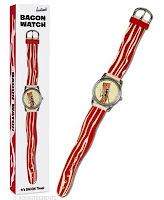 They're part of the "I Love Bacon" line and they are really really cool. They come in both a men's sports brief and a women's version, and are sure to make people smile. Well, any people who would get to see you in your undies, that is. They're $32 and $27, respectively, and actually might be worth that price based on sheer awesomeness. Next, you'll need to bacon-ify your feet. This is mandatory. 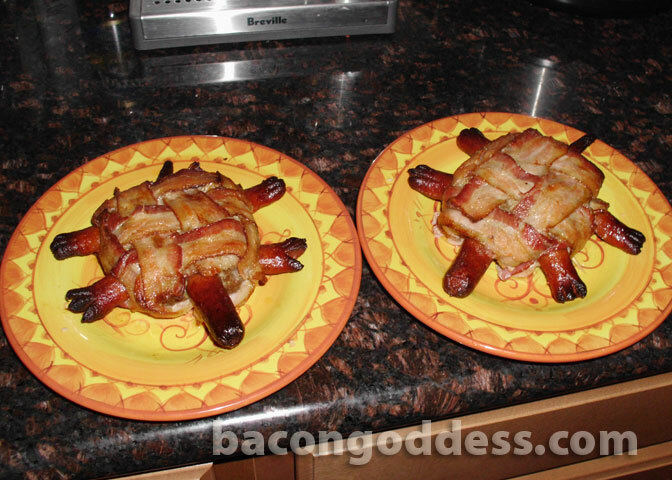 But you might ask, "How do I do this, Bacon Goddess?" Well, I'm here to tell you. Bacon socks. Bacon shoes. See, that wasn't so hard, was it? 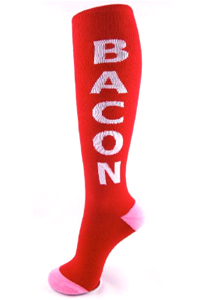 These are bacon knee high socks from Sock Dreams. Sock Dreams is only the best sock store in the entire universe. If you love socks you should shop there often. 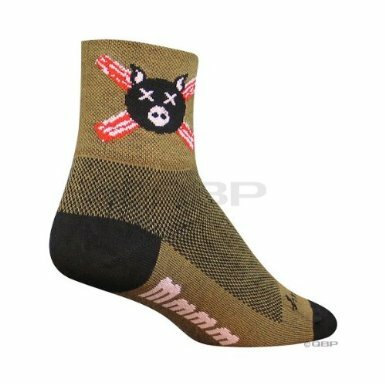 These are classic knee high crew socks with the word "BACON" emblazoned up the side. Straight and to the point. They're $10 and Sock Dreams has free shipping to the U.S. I may or may not have a pair on the way to me in the mail right now. These next socks are sold as cycling/running socks and I like them just a little bit better than the ones above. Because the pig has "X"es over its eyes and it has the word "mmmm" printed on the instep. Yeah, this is one classy sock from The Sock Guy for $8.99. 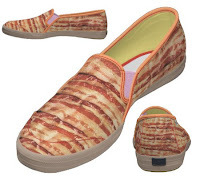 Okay, bacon shoes. Yes, they exist. Yes, they look amazing in the photos. But there's a problem. They're made by Zazzle. Zazzle is a print-on-demand company notorious for low quality transfer prints that fade very quickly and just don't have the vibrant colors you'd expect from other printing methods. I've personally seen three Zazzle t-shirts and a few coffee mugs that looked really bad. At $60 for a pair of these shoes, that's something you're going to have to decide on for yourself. I know that personally I would not risk it, regardless of how awesome they look in the pictures. They are Keds, though, and that's a good brand. But will it hold the color/vibrance of the print? I don't know. If anyone has purchased these, please comment and tell me what you think. Your neck needs bacon! 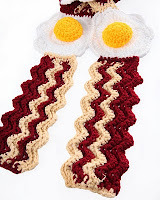 It's winter in the Northern hemisphere and it's time for a bacon-n-eggs scarf! This looks most excellent... and warm and snuggly. At $59, it's kind of pricey, but it looks handmade. If you want REALLY handmade, for $57 you can have a hand painted silk bacon scarf by seller crrysstall on Etsy. This is a simply beautiful piece of art. Of course, if you're a corporate type, you must have the tie. Oh, have you seen the tie? It rules. 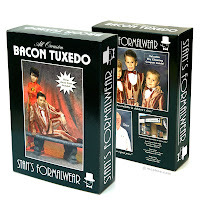 I would buy this bacon tie for my husband at $17.95 in three seconds flat... if I thought he'd ever wear it. Once again, I'm not quite sure about the quality of the printing. There's something about it that makes me suspicious. But at eighteen bucks, it wouldn't be that much of a loss if it turned out to be kind of crappy. 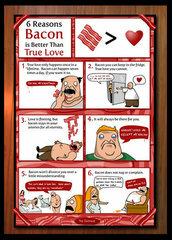 There you have it, bacon from head to toe! And now, I must leave you for the evening. I know this because my bacon watch tells me so! It's morning and you're running late. To late to cook yourself some bacon for breakfast. Sad. What do you do? You brew yourself some bacon coffee! 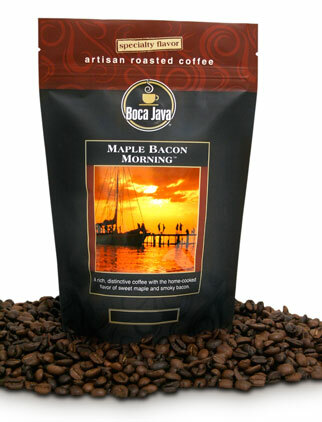 The folks at Boca java have come up with a flavored coffee that should make bacon lovers everywhere rejoice. "Reminiscent of a hearty Saturday morning breakfast around the table, this sweet, savory coffee delights the senses with the smell and taste of home! 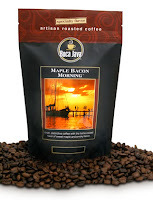 Maple Bacon Morning coffee combines our Brazilian Arabica coffee beans with the comforting flavors of maple syrup and bacon..."
This coffee is classified as a light roast, which I suppose would be good with the maple flavor, but personally I think a darker roast would compliment the bacon a bit better. It has to be good though, it has a 4.3 out 5 star rating and 313 reviews. It looks like some of the bad reviews are complaining about the flavor not being strong enough because of the light roast. Overall, though, 88% of the reviewers would recommend it to a friend. Buy it at the Boca Java website. You can get it in either whole bean or a universal grind. At $7.99 for half a pound, it's kind of up there in price, but then the $7.95 shipping doubles the price. Risky, for something you've never tasted. I would probably impulse buy this right now if the shipping wasn't so high. UPDATE! If you register on their site, Boca Java will send you a $5 off coupon! Looks like I might be trying this coffee after all. Everyone's seen the turtle burgers, right? 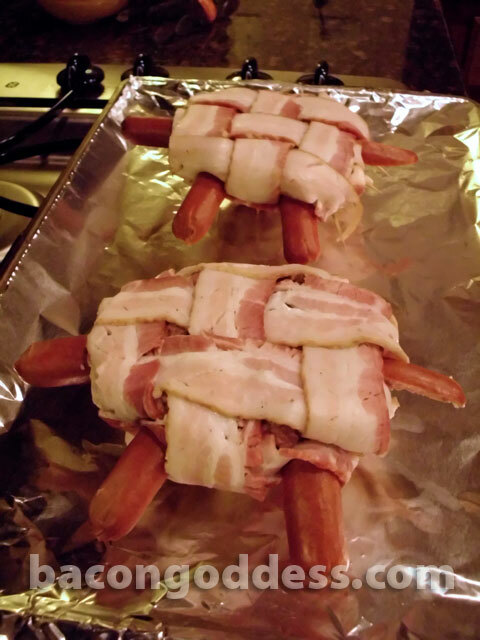 The photos going around the internets of those delicious bacon-wrapped hamburgers made into turtles with the addition of hot dog legs, head and tail frankly intrigued me. But there was no recipe, just a picture. I figured I could make them myself. So I did. You're gonna also want some toothpicks. Trust me. Mold yourself some quarter to half pound burgers with whatever seasonings you like in them. I like to put a bit of salt and pepper, some garlic powder and pinch of parsley flakes in mine. I think I made mine with 1/3 pound burgers, so you can judge by my photos how that size looks and plan your turtles accordingly. Now, take a sharp knife and slice the burger in half. Put your cheese inside and reseal the burger around it so the cheese is secreted away in the middle of the burger. The cheese WILL run out a little when it cooks, so judge your cheese amount accordingly. Cut a hot dog in half and then slice the halves in half lengthwise so they are domed on the top and flat on the bottom. With a sharp knife, make two slices on the end of each. These will turn into turtle toes as the burgers cook. The head can be a hot dog cut in half and the tail can be a quarter of a hot dog. Make the tail pointy for authenticity. I mean, you want your bacon turtle to look REAL, right? Now comes the tricky part. Carefully make holes for the legs, head and tail and push them in, domed side up. You can just coax the hamburger open a bit and then shove the hot dogs in further, but do it slowly and carefully. At this point, you might want to use toothpicks to hold the hot dogs in place while you add them all, as the burger might get a bit unstable. Make sure you smoosh the hamburger as tight against the hot dogs as possible to minimize cheese leakage. 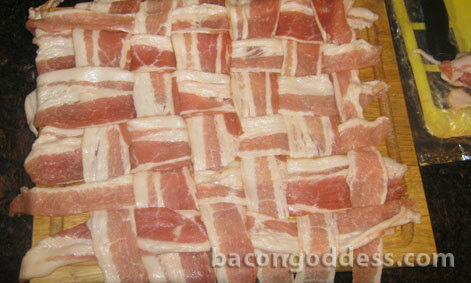 Time to weave some bacon! Do you remember basket weaving in junior high art class? Same concept. Cut your bacon strips in half and lay three of them next to each other vertically - touching. Fold the middle one all the way back and place another strip across the other two horizontally. Fold the middle one up again. Now fold the two end strips back over the horizontal strip. Lay another strip horizontally over the middle vertical strip. 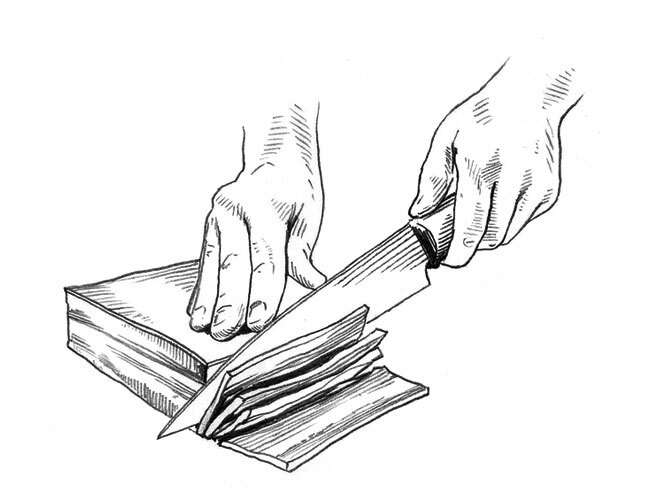 Fold the two end strips up again. fold the middle strip back again over the two horizontal strips... do you see where we're going here? I'm posting this photo of a bacon weave I did for something else so you can get the idea. Your turtle shell will NOT be this big! 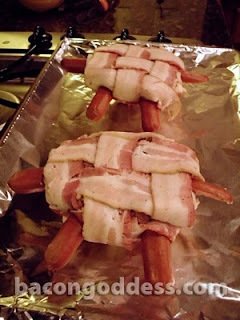 Make sure your weave is nice and tight, with no space between the strips and carefully lay your turtle - upside down - on top of your bacon weave. If you used toothpicks, push them through so no toothpick is showing on the top. Now fold the loose ends over the turtle, wrapping around the legs and head and tail and pull snug, but not too tight and secure with toothpicks. You can cut small slits in your bacon to stretch it around the head/legs if you need to, but the key word is small. Bacon stretches. When you're finished you should have a whole bunch of toothpicks sticking up in the air. Carefully flip the turtle over and adjust the toothpick depths so the turtle is actually balancing on the toothpicks, not on its legs. Alternately, you can just push the toothpicks in further and let the turtles sit on the bottom of your cooking vessel and fry in their own grease. 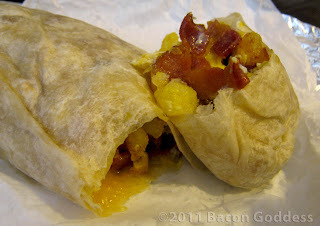 This is what mine looked like. Aren't they just the cutest? Your oven should be hot now and it's time to pop these guys inside. You can put them in a baking dish, but I used a large foil-covered cookie sheet for easy cleanup. 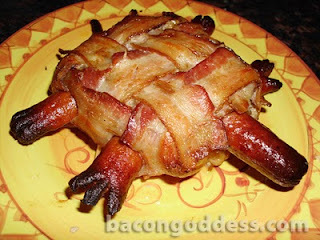 I believe I baked them for about 35 minutes at 350 degrees, or until the bacon was fairly browned and the ends of the little turtle feet started to look crispy and separate into their little toes. Awww. You'll want to let them sit for just a few minutes after removing them from the oven because bacon grease burns on your mouth are NOT fun. The bacon on the bottom will NOT be crispy if you cook them on toothpick stands. I think if you just let them bake in their own grease, it would probably cook the bottom bacon better, but for some reason I was thinking I'd cut a little fat by not cooking them IN the grease. Yeah, dumb. I'll do it the hambeast way next time. Promise. Your finished turtles should look like this. And yes, they were delicious. I like crisp bacon. I didn't think the bacon on top was crisp enough. So I turned on the broiler. Without draining the collected grease from the pan first! Yeah, it was a splattery, smoky mess as the grease started popping and exploding all over the inside of my oven. Made the bacon crisp, though. If you MUST crisp the bacon, move the turtles to a NEW foiled cookie sheet/baking dish before doing so. You might still get a little bacon splatter, but you can avoid potential grease fires and a huge mess to clean up. One of the coolest things about this recipe is you can change it up any way you'd like. You could use ground turkey and turkey dogs with no cheese to cut the fat. I would NOT suggest using turkey bacon, though. It's pretty yummy, but it's not REALLY bacon. Oooh - or you could try going gourmet with like ground buffalo and gouda with some sort of fancy flavored hot dog and one of the fancy schmancy gourmet bacons you can get from Bacon Freak. In fact, I might just try that this weekend. 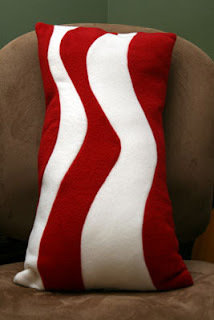 Go snuggle up with your Bacon Pillow and dream of meat candy. 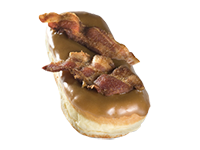 While exploring the internets, I found a blog called eatnlisten.com that is sponsoring a giveaway that bacon lovers might want to take note of. 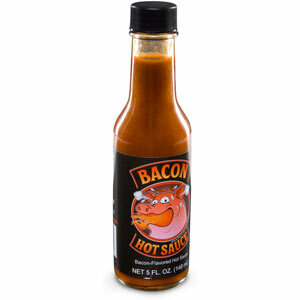 They're giving away six bottles of Bacon Hot Sauce to people who subscribe to their emails or retweet stuff. Looks like the drawing will be done randomly on February 9th. On a more awesome note, this find DID introduce me to Bacon Hot Sauce. The stuff looks pretty awesome! They have a site where you can buy it as well as find recipes to use it. I like it when a company actually gives you good suggestions on how to use their product! Yeah, that looks yummy. Okay, I'm sold, let's see what it's made of and how much this stuff costs. The ingredients page says it's made of Water, Distilled Vinegar, Cayenne Pepper, New Mexico Chili, Salt and the standard not-too-bad preservative stuff that you have to put in this kind of product. So, a basic cayenne sauce with a bit of chili... and bacon. The products page reveals that it's only $5.99 a bottle, which is not bad for an independent handcrafted hot sauce. BUT, when you start to checkout you'll see that shipping is five dollars! Damn. Okay, I'm ordering it anyway. This had better be some really good eleven dollar hot sauce, you guys! I'm assuming that if you order the three pack the shipping would be more reasonable, but I want to make sure I like it before I do that. As soon as it arrives I'll make something with it and post a review! If you have tried it and would like to share your opinion, please feel free to post your review in the comments. The 4th Annual Blue Ribbon Bacon Festival - Anyone Up for a Trip to Iowa? I was surfing the web today and happened upon a glorious sight. 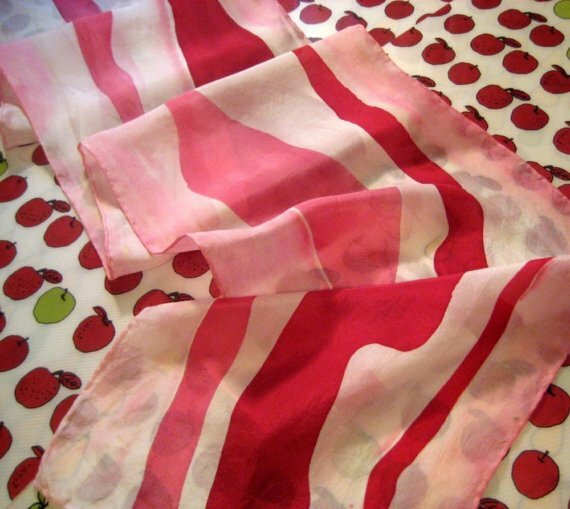 Did you know there's a whole bacon FESTIVAL that takes place in Des Moines, IA every year? That's right, folks, at the Blue Ribbon Bacon Festival you can celebrate nature's meat candy in style! The theme of this year's event is "Fields of Bacon…If You Fry It, They Will Come". I have to admit, I lolled. Tickets are only available online at blueribbonbaconfestival.com beginning at noon on Friday, January 21st. The festival will take place at Capital Square in downtown Des Moines from 10am to 4pm on Saturday, February 26th. It looks like tickets are $40 per person to get into the event, which will get you "a commemorative T-shirt, koozie, a wide array of bacon inspired delights from various food vendors, unlimited bacon samples at the Bacon Showcase, live music, bacon educational lectures, and a free drink ticket." Did I read that right? "Bacon Showcase"? Oh yes I did! This is their mascot... cooking bacon! Evidently the tickets sell out really fast, so if you're going, you'd better plan on being ready at noon on January 21st to do some fast clicking! They're expecting over 1500 people this year! They also have $125 tickets that get you into the main festival as well as into something called the Bacon Elegance Dinner. I don't know about you, but "Bacon Elegance" sounds like it's one o' them fancy sit-down dinners to me. Heh. This takes place on Tuesday night, February 22nd, so unless you want to spend the whole week there, it's probably more for locals. Tickets – Tickets are $40 for entry into the main event, and $125 for entry to the festival as well as the Bacon Elegance Dinner on the evening of February 22nd. The main event ticket entitles the holder to a commemorative T-shirt, koozie, a wide array of bacon inspired delights from various food vendors, unlimited bacon samples at the Bacon Showcase, live music, bacon educational lectures, and a free drink ticket. Due to 2010’s quick sellout, the maximum ticket purchase will be two (2) per order. Consumption –Last year’s 750 attendees consumed 1,200 lbs of bacon which is approximately 30,000 strips. If laid end to end it would reach the height of Empire State Building, 12 times over! Hmmmm... I wonder if a ticket and travel expenses would be tax deductible. Photos are linked from Blue Ribbon Bacon's Public Gallery on Picasa and are copyrighted by their authors.